We would like to introduce the report on the main indicators our Virtus Scholar Statistics Platform. This platform provides the key statistical data of papers published in our journals. We consider that the researches are to be shared freely in the scholarly sphere. It is an important factor for our authors with regard to the paper’s citation, views and readability it etc. Also, this will enable the theoretical results which will be practically applied in corporate governance. Our Platform Statistics is a part of our open access policy. The editorial team is glad to present the results of our analysis concerning the views and downloads of the papers published in our journals in the last month. The statistics is divided into 2 parts: Article Views Statistics (views data counts starting from March 2017) and Geographical Statistics (downloads data counts starting from August 2018). all the time – 613296.
all the time – 174.1. 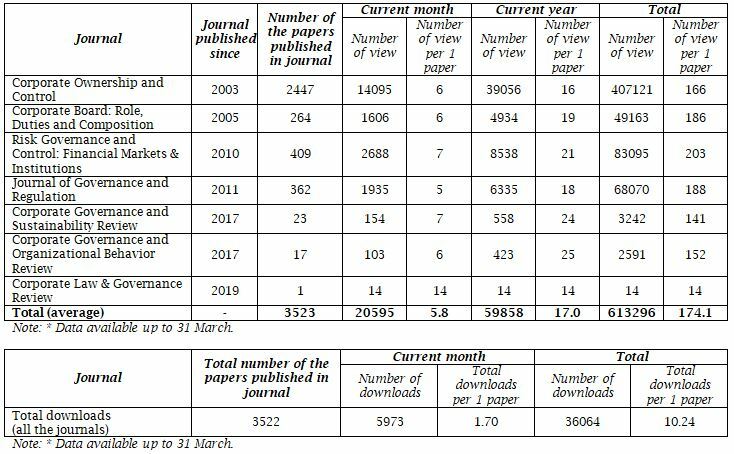 Hence, there was increase over the previous month in the numbers of view papers and per 1 paper on 35.8% and 35.3% accordingly (for March). The total journal views rose by 53% for the current year and on 3.5% for all the time, compared to the previous month. This indicates that the total views of the papers published in our journals are steadily increasing. the total time – 36064.
the total time – 10.24. It is important to note that geographically our journal papers have been downloaded to read by scholars from all continents. Last month, papers were downloaded from 82 countries and the total time – from 148 countries. The number of total countries has increased by 1.4 % for the whole time, compared with the previous month. Thus, the results of the analysis display the positive dynamics of the journal views and downloads of papers published in our journals are improving. The statistical data and our calculations confirmed it. All data based on the Platform Statistics and internal database. We are going to keep our international scholarly network updated on the further changes in our Virtus Scholar Statistics Platform.